Huehuecuetzpalli mixtecus (Reynoso 1998, Early Cretaceous, Middle to Late Albian, Fig. 1) is very primitive lepidosaur known from two closely associated specimens, one a juvenile, the other an adult. Huehuecuetzpalli has taken center stage here (at PterosaurHeresies) and at ReptileEvolution.com as a basal member of the Tritosauria. This third clade of squamates includes an odd assortment of drepanosaurs, tanystropheids and fenestrasaurs including pterosaurs that have been completely ignored and overlooked in all professional lizard studies. Figure 1. The father of all pterosaurs and drepanosaurs, Huehuecuetzpalli, a basal lepidosaur. A recent paper by Gauthier et al. (2012) considered Huehuecuetzpalli among the many lizards in its tree. A few quotes from that paper are worthy of attention. They nested Huehuecuetzpalli alone between sphenodontids, like Gephyrosaurus and Sphenodon, and the Squamata (all other known lizards, divided by the Iguania and Scleroglossa (including snakes)). Unfortunately Gauthier et al. (2012) did not reference the large reptile tree (or create their own more expansive tree of lizards) so they completely overlooked the tritosaurs as descendants of a sister to Huehuecuetzpalli. It should not have nested all alone. There was an opportunity missed that became yet another case of taxon exclusion. Below I make comments (in hot pink) on the small section of Gauthier (2012) regarding Huehuecuetzpalli. “Stem squamata – Given the antiquity of the squamate stem—which must extend deep into the Triassic (1)—surprisingly few stem fossils can be referred with any confidence to that great branch of the lepidosaur tree (2). Huehuecuetzpalli mixtecus, from the Early Cretaceous of Mexico, seems to be one of these (Reynoso 1998). 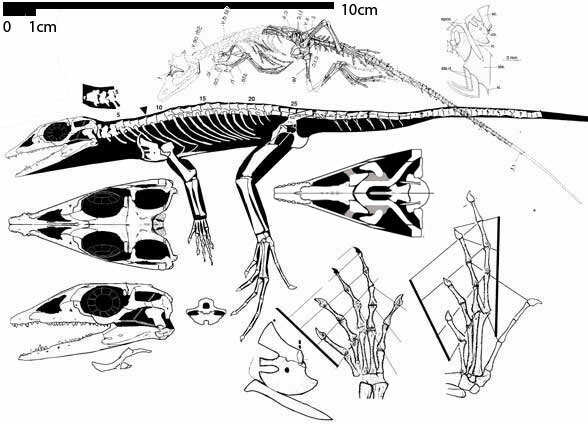 This species is reasonably well known by the standards of Mesozoic lizard paleontology, as it is represented by two fairly complete skeletons, with some patches of skin impressions, of juvenile and nearly adult individuals. H. mixtecus apparently represents an entirely extinct side branch off the squamate stem (3). All major living clades of lizards— Iguania, Gekkota, Scincomorpha and Anguimorpha—diverged by the Late Jurassic (Estes 1983; Conrad 2008 (4)). Albian-age H. mixtecus must therefore have been separated from the surviving branch of the lizard tree by anywhere from 25 to 50 million years (5). Unsurprisingly, it displays several distinctive autapomorphies (see Appendix 4). (2) Listed above and look for others here. (4) We can be confident of a much earlier Late Permian date for the tritosaur/squamate split due to the preponderance of fenestrasaur tracks in the Early Triassic (Peabody 1948). (5) Add at least the entire Triassic to this number. (6) This is reversed in some, but not all tritosaurs, principally by the shortening of the lateral temporal fenestra and the redevelopment of a quadratojugal with a loose connection to the quadrate. (7) This dorsal series finds the acme of its expression in Longisquama. (8) The Diapsida that Gauthier et al. 2012 is thinking of is diphyletic. (10) As in tanystropheids and fenestrasaurs including pterosaurs. Besides the Tritosauria, Gauthier et al. (2012) excluded several fossil lepidosaurs that were key to understanding relationships in the large reptile tree. Without these their tree suffers by comparison despite its size. Taxon exclusion needs to become a thing of the past. Professional studies have suffered long enough. Gauthier JA, Kearney M, Maisano JA, Rieppel O and Behlke ADB 2012. Assembling the Squamate Tree of Life: Perspectives from the Phenotype and the Fossil Record. Bulletin of the Peabody Museum of Natural History 53(1):3–308. Peters D 2007. The origin and radiation of the Pterosauria. In D. Hone ed. Flugsaurier. The Wellnhofer pterosaur meeting, 2007, Munich, Germany. p. 27. This entry was posted in academic publication, lizards, Tritosauria and tagged lizards, Tritosauria by davidpeters1954. Bookmark the permalink.